This material is compiled from the published works and unpublished lectures and dictations of Mark L. Prophet and Elizabeth Clare Prophet. Sources are noted for each entry. Many topics list resources where more in-depth information may be found. Click here to search for a particular topic. Click here for a list of all topics. Click here for a list of categories. 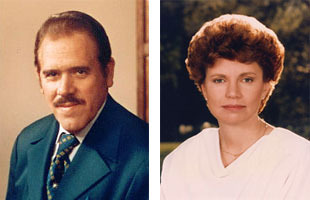 Mark L. Prophet and Elizabeth Clare Prophet are pioneers in modern spirituality and internationally renowned authors. From the founding of The Summit Lighthouse in 1958, for more than forty years they set forth the the teachings of the ascended masters—the immortal saints of East and West who have become one with God in the ritual of the ascension. They taught that the essential spiritual truths at the heart of all the world’s religions are the same, and they showed how spiritual seekers from any background can walk a path towards reunion with God. Among the Prophets’ most important contributions were to awaken the world to the science of the spoken Word and to promote the use of the violet flame for personal and planetary transformation. They have written more than 100 books, which have sold millions of copies around the world. Among their most important titles are The Lost Years of Jesus, Reincarnation: The Missing Link in Christianity and Saint Germain On Alchemy.